Enhances motor planning and visual motor skills. Long Beach Day Nursery has many creative art ideas for early childhood classrooms that I could hardly decide which one to share with you first. 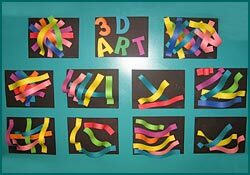 This 3-D Art Display was my favorite because it takes an important developmental skill (spatial relations development) and makes it easy, affordable, and fun for children of all ages and ability levels to exercise visual thinking skills. Plus the end results look great! Simply take strips of colored construction paper and apply Tacky Glue with craft sticks to each end, then press down on both ends to create dimension. This idea makes a unique bulletin board for classrooms and hallways, as the colored paper loops "pop out" to draw in curious viewers. Thanks to Amy Bigelow, Program Director at Long Beach Day Nursery in Long Beach, California, for sharing many creative ideas from her talented teachers. More to come, soon! My name is John Funk and I am the Educational Programs Manager for Excelligence Learning Corporation. I am also a clinical university instructor. I was approached recently by a state education agency inquiring about my recommendations for an entire ‘special needs’ curriculum. I was surprised by this request as I have always been keenly aware of the need to individualize for each special needs child. In fact, the Individuals with Disabilities Education Act (IDEA) specifically requires that each identified special needs child should have an Individual Education Plan (IEP). The very nature of that requirement would make a standardized special needs curriculum appear to be a conflict in concept and principle to Federal regulations. However, I do believe it’s very important that special needs children should have a generalized roadmap of skills from which to travel, even when they travel on their own individual time frame. I told the agency making the request that they should use the same core standards that they would use for typically developing children. The IDEA also demands that special needs children be in the ‘least restrictive environment.” In other words, we want to see these children progress and be included into the regular classroom environment, when possible and appropriate. Being included in a regular classroom also means that the special needs child will be working on common skills with the rest of the group. It is always our hope that developmentally challenged children will eventually be able to master the common core standards that we support for every child. Traditionally, special needs professionals have a key role in developing an educational plan for each child with challenging circumstances. Part of that educational plan should establish ways for the child to develop basic educational skills. The agency that approached me about a special needs curriculum was trying to find a “one size fits all” approach to working with their special students. It’s my opinion that the task of educating children should never be approached in that manner, even with typically developing children. I believe that the answer is for each teacher to create a roadmap of skills appropriate for the age of the individual child. With that very special roadmap, the teacher, along with other professionals involved in that child’s education and development, should guide each child on his/her important journey of skill acquisition. I am interested in knowing your ideas and opinions on this subject. Can there be broad-based curriculum for children with special needs?